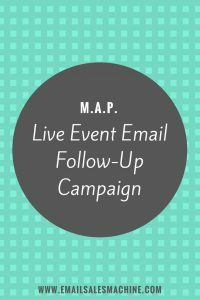 Need An "Event Follow-Up" Email Campaign ﻿Fast? This Marketing Automation Plan (M.A.P.) is a complete system that's designed to help you launch an event follow-up drip campaign series no matter what type of email automation software you're using.